5S tools to support your business. 5S is a structured approach to getting a workplace cleaned up, organised, standardised -- eliminating waste materials and wasteful practices, and then sustaining the improvements that were made. It is called "5S" based on the five Japanese words, each of which starts with the letter "S," that describe the five steps this involves. There are many articles that provide excellent overviews , but what are the benefits of 5S? A key principle of 5S is to get rid of items that are not used, and make it more convenient to find those items that are needed. This gets rid of clutter, unnecessary tools, scrap materials and unused supplies. It organizes, labels and places close at hand those tools and materials that are needed on a regular basis. The result is that more time is spent productively and less time is wasted finding needed tools and materials. In 5S needed materials, tools, machines and equipment are positioned in ergonomic locations. This helps reduce fatigue, makes them easier and faster to access and use, and results in a safer workplace. In addition, ergonomic positioning helps to address and eliminate the seven wastes. Standardization is also a part of 5S. Standardization ensures that the most efficient work practices are identified and used, and that wasteful work practices, unnecessary tools, unused materials are eliminated. By eliminating unused materials, tools and equipment, and getting rid of clutter, a surprising amount of space will be freed up. There is a cost associated with space, not only in the rental or lease costs, but in heating/cooling, cleaning and maintaining of that space. When machines, equipment and tools are kept clean and free from clutter, it is easier to spot defects, part failures, and problems such as an oil leak. This allows preventative maintenance to address the problem before it becomes a more serious problem. For example, if a machine is kept clean, an oil leak would immediately be noticed. The source and cause of the leak can be quickly identified and the problem fixed, before low oil levels lead to more serious damage to the machine. Cleaning Stations are an excellent way to not only provide one central place for cleaning equipment and products they also provide a central physical demonstration of your 5S philosophy to the workforce. Clean means that spills get cleaned up ASAP, eliminating the potential for slips and falls. Clean means clutter is removed, revealing hidden electrical, chemical or mechanical hazards. Having needed tools, materials and supplies close to where they are needed greatly reduces travel (movement) and as a result reduces the potential for injury. Standardisation means that unsafe practices are eliminated because those practices are not a part of the standards. Employees who have their eyes open for spotting ways to improve using 5S principles will also be more aware of their surroundings and potential safety hazards. When your employees see you care about them, their work area, and that you value their input, they care more about their job. 5S naturally leads to this result. 5S is dependent on employee participation. 5S leads to employees being more engaged with their job. The clean, organized workplace that results from 5S is a more pleasant workplace that leads to improved employee attitudes. The focus on cleanliness, organization, labour-saving efficiency, having the right tools, and using quality standards leads to an increased pride in workmanship. Add in the improved safety (lower numbers of injuries) resulting from 5S and you get a workforce that is happier (less turn-over), more motivated, is getting more done with less effort, and is interested in further improving their workplace and your products. 5S reduces clutter and that means it is less likely that items will be lost or damaged. 5S makes needed tools conveniently and readily available, and that means the right tool for the job will be used and the job will be done right. 5S ensures tools are properly stored with the result being that products will not be damaged by unsecured tools falling on or into work-in-progress. 5S cleanliness helps reduce maintenance, and properly maintained machines, tools and equipment mean quality standards will be maintained. 5S produces improved employee morale and attention to detail, and that brings higher quality. 5S is one of the most cost-effective lean techniques available, and it is the foundation to all other lean techniques. That makes 5S the perfect starting point for bringing the benefits of lean to your workplace. It is simple to get started with 5S... just start getting your workplace cleaned up and organised. 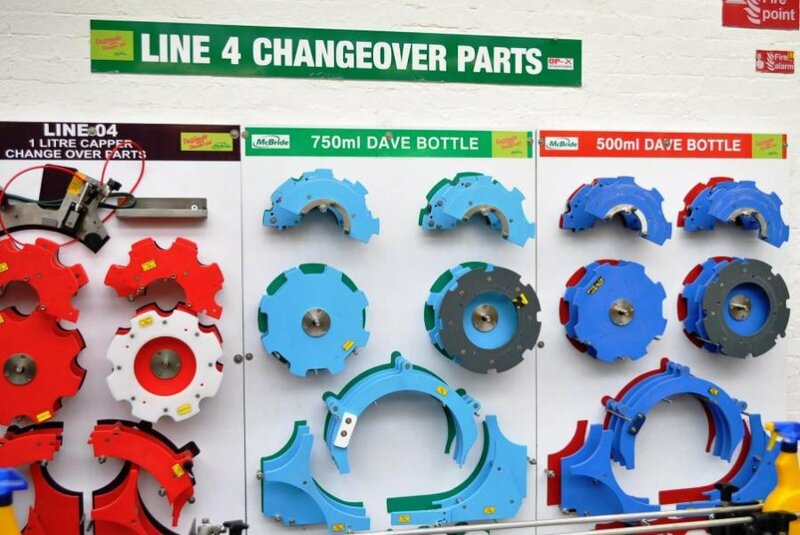 Get a Nnational Engravers to supply you with robust quality shadow=boards, cleaning stations to mark and label everything so that tools, supplies, equipment and materials can be properly identified and stored. 5S is foundation to all other lean techniques and having proper labeling and signs is foundational to 5S. Call 01233 840999 today and ask about how 5S can benefit your organisation.